b 1875 Sheffield. 1911C Sheffield. Red Cross record; Cliffe Cottage, (Jaggers Lane? ), homeworker, knitting & needlework at Hathersage VAD Hospital. There was a Pte Wood of A coy 5 Volunteer (Hathersage) Battalion at A D King’s funeral in Nov 1918, and he is probably George Edwin Vaughan Wood b 1872 Conisborough. 1911C living at Cannon Fields, Hathersage, a chartered accountant, who would have been over age for active service. Red Cross records; c/o Miss Hickinson, Crossland Road, Hathersage, general duties at Hathersage Red Cross VAD Hospital. Capt RAMC unit 1907, Boulogne. b 1891 at Sheffield, son of Dr Charles and Ellen of Walkley House, Sheffield, brother of Charles (above). 1901C at Oak View Boarding School, Hathersage. 1911C a medical student at Sheffield University. † ≠ Enlisted on 11/9/1914. 12/272 Pte 12 Bn Y & L (Sheffield City Battalion). He accompanied the Battalion to Egypt in December 1915 and then to France in March 1916. Although his service record survives, parts are illegible. However, it appears to show that he sustained an apparently minor back wound. 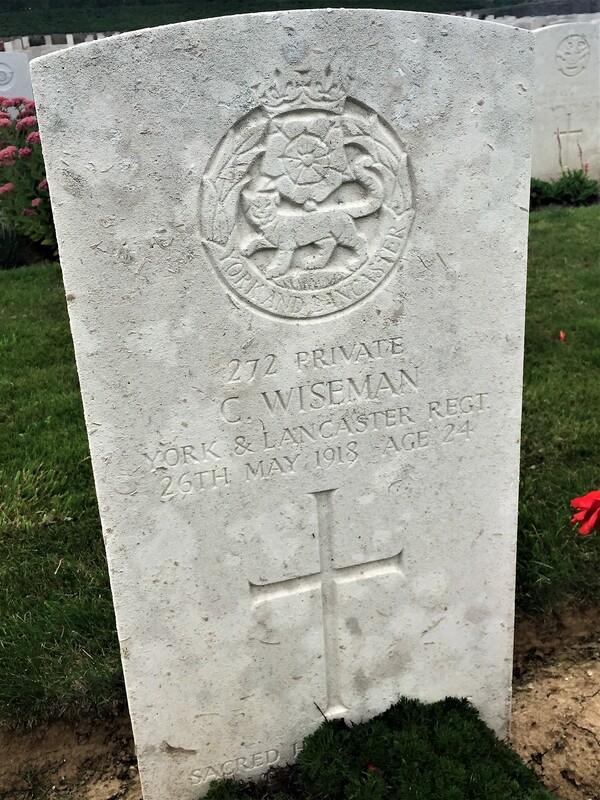 He was treated at 30 Casualty Clearing Station and re-joined his battalion on 9 July 1917. On 20/9/1917 he was evacuated home after suffering a bout of trench fever and spent a month in hospital. He returned to France on 6/4/1918 and was posted to 2/4 Y & L, joining them in the field on 13 April. K I A 26/5/1918. Grave; Bienvillers Military Cemetery, Pas de Calais, France. b 1893 at Sheffield, son of Dr Charles and Ellen of Walkley House, Sheffield, brother of James (below). 1901C at Oak View Boarding School, Hathersage. He was a dental student at Sheffield University, where he was also a member of the Officer Training Corps. His name appears in the University’s Roll of Honour. b 1886 Ireland. 1911C Ivy Cottage, Church Street, (now School Lane), wife of Ernest Charles Winter. Red Cross record; nurse at Hathersage VAD Hospital. ă 2/Lt Royal Engineers. b 1880 Madras, India. 1911C and on 1918 Absent Voters list a civil engineer living at Ivy Cottage, School Lane, Hathersage, with his wife; Madeline, b Ireland, working for the Derwent Valley Water Board. The various War Hospital Supply Depots were run by private individuals. The Hathersage Red Cross Auxiliary Hospital Supply Depot was run from Hall Cottage, Hathersage, by Mrs Winder. (Listed as the ‘Township Leader’ in Red Cross records.) She was married (Jane Wells) to Charles Aston Winder, about Aug 1879 in Newport, Monmouth and mother of Basil Hathornthwaite Winder, above. She died age 80 in 1923. In the Red Cross records her husband was shown as being responsible for all repairs and carpentering at the Hathersage Hospital. Husband of Jane Winder, father of Basil Hathornthwaite Winder. On page 45 of ‘Hathersage Images from the Past’ is a picture of Charles Winder who lived in Hall Cottage on Baulk Lane. He was a retired owner of an Iron Foundry in Sheffield, and the Red Cross records show him as being responsible for all repairs and carpentry at the WW1 Hathersage Red Cross VAD Hospital. He was serving in the volunteers and military before WW1. (London Gazette, 24/11/1908; ‘6 Battalion, The Sherwood Foresters, the under-mentioned officers, from the 2 Volunteer Battalion, are appointed to the battalion, with rank and precedence as in the Volunteer Force, except as stated below. Dated 1/4/1908 :—Captain Basil Hathornthwaite Winder reverts to rank of Lieutenant, with precedence from 29/10/1906’). (DC 19/9/1914 about 6 Bn Notts & Derby’s preparing for war, mentions Captain Winder, formerly of Hathersage). b 1880 at Sheffield, son of Jane and Charles Aston Winder, (his father is depicted on p 45 of the booklet; ‘Hathersage Images from the Past’).